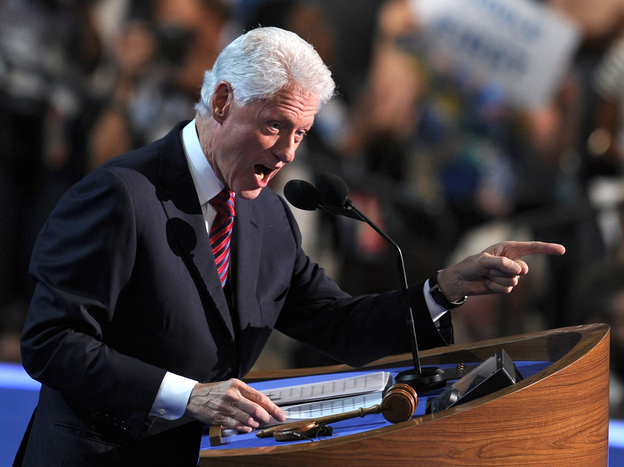 Vous avez surement lu/entendu parlé de l’excellent discours de Bill Clinton ce mercredi soir a la Convention Nationale des Démocrates? Si vous étiez sur une autre planète et que vous avez manqué cela, je vous propose de le revivre en version originale. Il faut savoir que les commentateurs et autres analystes politique du pays de l’Oncle Sam sont quasi unanimes sur la qualité de ce discours. Certains arguant que c’est le plus beau discours d’un homme politique du pays depuis 20 ans. Rien que ca. Et vous qu’en avez vous pensez? « We’re here to nominate a President, and I’ve got one in mind. President Obama’s « all of the above » energy plan is helping too – the boom in oil and gas production combined with greater energy efficiency has driven oil imports to a near 20 year low and natural gas production to an all time high. Renewable energy production has also doubled. When Congressman Ryan looked into the TV camera and attacked President Obama’s « biggest coldest power play » in raiding Medicare, I didn’t know whether to laugh or cry. You see, that 716 billion dollars is exactly the same amount of Medicare savings Congressman Ryan had in his own budget. Here’s what happened. When some Republican governors asked to try new ways to put people on welfare back to work, the Obama Administration said they would only do it if they had a credible plan to increase employment by 20%. You hear that? More work. So the claim that President Obama weakened welfare reform’s work requirement is just not true. But they keep running ads on it. As their campaign pollster said « we’re not going to let our campaign be dictated by fact checkers. » Now that is true. I couldn’t have said it better myself – I just hope you remember that every time you see the ad. My fellow Americans, you have to decide what kind of country you want to live in. If you want a you’re on your own, winner take all society you should support the Republican ticket. If you want a country of shared opportunities and shared responsibilities – a « we’re all in it together » society, you should vote for Barack Obama and Joe Biden. If you want every American to vote and you think its wrong to change voting procedures just to reduce the turnout of younger, poorer, minority and disabled voters, you should support Barack Obama. If you think the President was right to open the doors of American opportunity to young immigrants brought here as children who want to go to college or serve in the military, you should vote for Barack Obama. If you want a future of shared prosperity, where the middle class is growing and poverty is declining, where the American Dream is alive and well, and where the United States remains the leading force for peace and prosperity in a highly competitive world, you should vote for Barack Obama. Article suivant Interview Décalée – 5 Questions Capitales a Yerusha, Artiste Ivoirien.